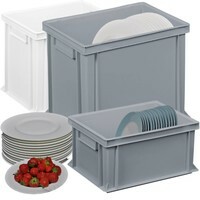 Our plate crates and bins with the foot print 400 x 300 are the best fit for the storage and transportation of your tableware and cutlery. 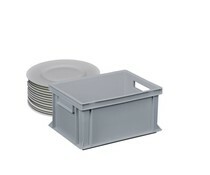 The plastic boxes are design to carry high loads – you can stack several crates on each other. 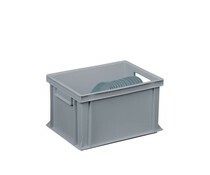 Our 400 x 300 x 320 bin can stand up to 600 kg stack load! All crates are manufactured in a practical Euro-size and can be easily transported on pallets or dollies. 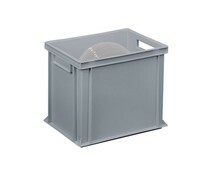 An important feature of plastic bins in general is the easiness to clean. 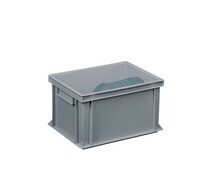 The crates withstands temperatures between -20° and +8°C. All products are manufactured of food proved plastic, so you can also use them for food transportation. 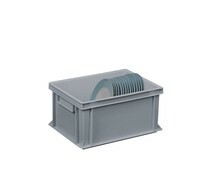 The boxes can be delivered with attached or cover lids. For heavy loads we recommend to use our plastic cases with ergonomic handle. 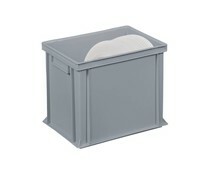 On request we can print your individual logo on the container.